Schemas are a learning theory developed by Jean Piaget. Piaget believed that children were not just not as good at thinking as adults but that rather the way they thought was itself very different to adults. Schemas are patterns of thought or behaviour that manifest in repeatable actions. Children may want to repeat the same, or similar, actions in order to explore and make sense of the world around them. You may notice a child being fascinated with wanting to read the same book over and over or moving things from place to place. Piaget theorised that schemas are an important part of how children learn and develop. Being aware of schemas allows you to ensure you provide opportunities in Forest School sessions for children to engage in and explore their schematic behaviour. Giving a child responsibility for collecting and organising resources for activities. Provide wheelbarrows, baskets, jars or buckets for gathering and transporting resources. Activities that involve camouflage and hiding objects. Activities that involve wrapping objects or building dens or houses where what is inside can’t be seen. Playing games that involve hiding such as ‘1,2,3 Where are you?’ and ‘Vanish’. Using natural materials to build rope swings and see saws. Build slopes or ramps to roll objects down. Building rope ladders or rope bridges. Archery, catapults, sling shots or other activities that involve knocking targets down. Climbing trees. Provide opportunities for children to play with and mix different natural materials such as leaf litter, mud, sand and water. Encourage children to make ‘potions’ or play cooking with these materials. The Zone of Proximal Development (ZPD) is a learning theory introduced by psychologist Lev Vygotsky. Vygotsky was a supporter of independent thinking and learning and was a critic of the teacher-led instruction that is still prevalent throughout classrooms today. He developed the ZPD theory as a method or arguing against the use of academic testing to measure students intelligence. Vygotsky argued that it would be better to examine children’s ability to solve problems independently and his or her ability to solve problems with an others help. This ‘other’ does not have to be the teacher, or Forest School leader, but could be a parent or another child. 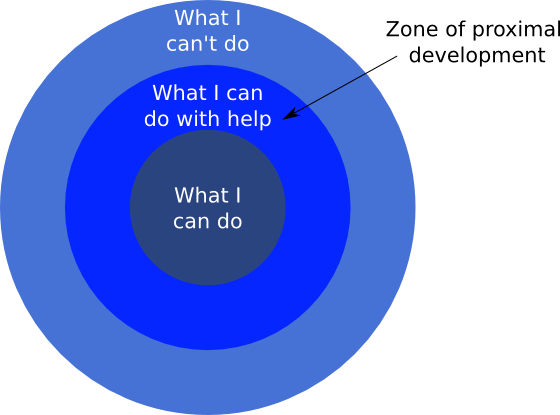 The ZPD is the area between what a learner can do without any help or assistance and what they are unable to achieve even with support and help. It is in this area, when we are just outside of what we already know and what we are comfortable doing, that Vygotsky theorised the most engagement and learning would occur. Activities that are too easy for a child are likely to become boring quickly. If they are too difficult it will likely be difficult to engage the child. It is worth being mindful of the ZPD theory when planning and running Forest School sessions. It is likely that the children in any session will all have very different knowledge, skills and abilities. Activities should be flexible and feature gradual increments in difficulty or complexity in order to be able to find the ZPD for each child. It may also be worth considering encouraging or engineering situations where specific children work together in order for one to be able to support the learning of the other.